^ "The Long-Lost, Rebuilt Recording Equipment That First Captured the Sound of America". WIRED. Retrieved 2018-02-28. ^ "Watch Nas, Jack White Reinterpret 1920s Blues Song". Rolling Stone. Retrieved 2018-02-28. ^ "'The American Epic Sessions': London Review". The Hollywood Reporter. Retrieved 2018-02-28. ^ Hunter-Tilney, Ludovic (May 19, 2017). "American Epic". Financial Times. Retrieved 2018-02-28. 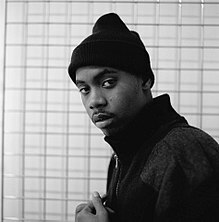 ^ "Nas - One Mic, The Sessions, American Epic, Arena - BBC Four". BBC. Retrieved 2018-02-28. ^ "American Epic: The Collection & The Soundtrack Out May 12th | Legacy Recordings". Legacy Recordings. 2017-04-28. Retrieved 2018-02-28. ^ "KANYE WEST on Twitter". Twitter. Retrieved 2018-04-23. 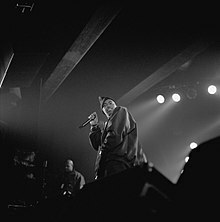 ^ "BLEEK ON ETHER:"IT WAS A GLOOMY DAY"". Allhiphop. February 13, 2013. Retrieved 2013-02-13. 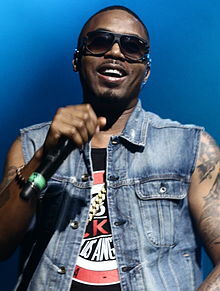 ^ "Nas Writes Seven-Part Series of Instagram Posts to Ex-Wife Kelis". The Source. 2018-09-07. Retrieved 2018-11-01. 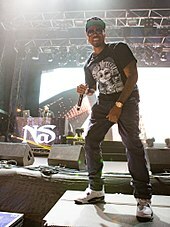 ^ "Nas Joins Divine, Naezy & Ranveer Singh For "NY Se Mumbai"". HotNewHipHop. 19 February 2019. Retrieved 1 March 2019. ^ "Hear Nas Jump In with Divine and Naezy on 'NY Se Mumbai' -". Rolling Stone. 12 February 2019. Retrieved 1 March 2019. This page was last edited on 9 April 2019, at 17:46 (UTC).